ANWR Update - These Guys Just Won't Give Up! Two WattHead Milestones - Welcome New Readers! Mitsubishi Motors will feature a new MIEV (Mitsubishi In-wheel motor Electric Vehicle) concept car at the upcoming 2006 North American International Auto Show (the Detroit Motor Show, scheduled for Jan 8-22nd), according to a press release issued yesterday. The MITSUBISHI Concept-CT MIEV is a four-door, four-passenger series-parallel hybrid that uses a gasoline generator and a bank of high energy-density lithium-ion batteries that power the in-wheel motors and drive each of its four wheels. The Concept-CT is ment to showcase technology that, according to the Chicago Tribune, will be featured in a Mitsubishi mini-car to be introduced to the U.S. market "after 2008." The car will likely be based on the Colt currently being sold in Japan and will compete with Toyota's Yaris, Honda's Fit and Nissan's Versa all due out in the U.S. this coming Spring. While Mitsubishi will be late to the game, their offering will be a hybrid electric MIEV (the other three are all gas-only) and there is even talk that Mitsubishi will offer it as a plug-in. Development of their MIEV technology was first announced this May when Mitsubishi unvieled their The Colt version is a rear-wheel drive all-electric vehicle fitted Colt MIEV test-bed. with two 20 kW in-wheel motors that deliver 600 Nm (443 lb-ft) torque each to the rear wheels. The Colt MIEV has a top speed of 150 km/h (93 mph) and a cruising range of 150 km (93 miles) on a single charge. Mitsubishi used the Colt testbed to perform on-road testing to identify and resolve any problems unique to the in-wheel motor vehicle, including any deterioration in road holding and ride comfort due to increases in un-sprung weight, as well as reliability and durability issues in the in-wheel motor system and its peripheral components (suspension, wheels, tires). They simultaneously worked on developing a more powerful version of the in wheel motors for 4WD applications. These made their debut in the Lancer Evolution MIEV announced in August. This new version of the motor uses a hollow doughnut construction that locates the rotor outside the stator as opposed to a common electric motor where the rotor turns inside the stator [see graphic a bit below]. The Lancer used four motors, one in each wheel, to deliver 4WD capability. Each motor, manufactured by Toyo Denki Seizo K.K., produces a maximum output of 50 kW with 518 Nm of torque. A 355V lithium-ion battery system comprising 24 modules fits under the floor between the front and rear wheels to provide power. The Lancer Evolution MIEV has a top speed of 180 km/h (112 mph) and a cruising range of 250 km (155 miles) [Note the improvement over the Colt released just a few months earlier]. Mitsubishi is using the Lancer MIEV to evaluate the outer-rotor motor under a range of driving conditions. They have acquired vehicle type certification for the Lancer that allows the car to leave the proving ground and be tested under normal driving conditions on public roads. The Lancer was also entered in the Shikoku EV Rally 2005, held August 27-28 on the island of Shikoku, Japan [I'm not sure how it did... anyone know?]. The new Concept-CT MIEV seems to use the same in-wheel motors as the Lancer except they are used here in a series hybrid application. A gasoline engine will work as the genset for the car with the lithium-ion battery pack to provide power for the in-wheel electric motors. This would presumably be the same set-up as for the mini-car for retail release with the possible addition of plug-in capabilities. Greater ease of raising power output and torque. Higher torque allows the speed reducer unit to be eliminated, meaning less weight and improved power transmission efficiency. Better space efficiency with the brake assembly fitting inside the motor which itself fits neatly within the wheel house. The outer-rotor arrangement also surmounts the difficulties presented to date by the steering system, making it suitable for fitting to and driving the front wheels—and facilitating 4WD in-wheel motor vehicles. the in-wheel motor makes it possible to regulate drive torque and braking force independently at each wheel without the need for any transmission, drive shaft or other complex mechanical components. 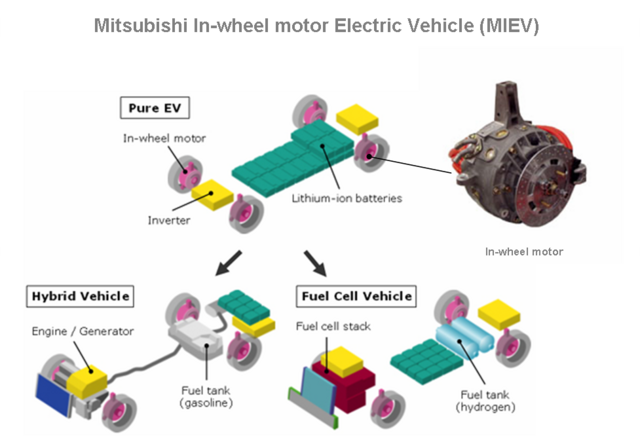 For this reason, MIEV offers highly promising potential in the ongoing evolution of Mitsubishi's all-wheel control technology ... The fact that the drive system is housed inside the wheel itself offers significantly greater design freedom and also makes it easier to locate such space-consuming components as the battery system, fuel cell stacks and hydrogen tanks used in hybrid and fuel cell vehicles. The MIEV concept seems to be a versatile one with potential applications in hybrids, all electrics and fuel cell vehicles. Most importantly though, Mitsubishi's development of this system may well breath new life into the potential of the electric vehicle at a time when other major manufacturers have turned away from straight EVs and are even reluctant to discuss plug-ins. Mitsubishi is not only developing full EVs but even hybrids that only use the electric drive train and use the gasoline engine only as a generator and their Vice President for Marketing is even openly talking about plug-ins. Mitsubishi press release on the Colt MIEV - May 11, 2005. You may have all of these ideas and suggestions as a Gift from me. I will make no claim or attempt to patent any of these ideas. I suspect that others have already patented some of this, but since I have no plans to produce any of these devices commercially, I haven’t bothered to check. I started sharing this with everyone I could several years ago. It looks like a few are beginning to catch up. Mitsubishi has produced the wheel drive system. Their design uses only LI batteries. It is strictly plug in. When you open the engine compartment, there is just a big open space. I really think this is the way to go. With a strong commitment by the feds, we could grow and process all the biodiesel we need from algae grown around the Salton Sea. For a few years I have offered anyone who cares to listen the following info: One of the American automobile companies has responded. I have had some positive response from several educational institutions but - as far as I know - none have done any experimental work to verify my claims. In one scale or another every one of these systems have been proven. Like to produce a vehicle that can burn rubber on takeoff on all four wheels and get 90+ mpg? 2. A 111 volt Lithium-Ion Polymer battery pack. 3. Nothing but wires going from the controller to every wheel, except for the necessary additional friction brakes (of course). 4. An added advantage of this would be the ability to recharge from the electrical grid while at home, saving even more on fuel. Each wheel, depending on the feedback to the controller from wheel speed sensors would drive with just the right power depending on the accelerator position. You would get recharging from deceleration just as you do in today's hybrids. You would also use this feedback to stop the wheel from skidding. The braking system would be electrical. Each wheel would have a stationary stator and a series of fixed magnets closely adjacent all around the inside of the wheel. In a sense it would operate each wheel in a very similar fashion that the maglev trains use, except the motion would be circular, of course. Something very different about this type of motor is that the stators are fixed to the axles and the magnets are driven around them. This gives a significant increase in mechanical advantage. That's like turning an ordinary electric motor inside out. There would be no need for ordinary electric motor brushes. In fact, many electric motors operating today are brushless. Such motors already exist in the model airplane field and their efficiently is amazing - approaching 90%. I've got a couple and doubt that I would ever buy any other type. It's possible to hang the model on the prop right out in front of you and accelerate straight up, like a rocket, with this type motor. In the vehicle the motor/generator would not turn on to recharge the batteries until they needed it. There is already experimental Lithium-Ion driven cars that can get in excess of 200 miles before they have to be recharged by plugging them in. You would top off your batteries overnight by plugging them in. Some cutting edge research by Toshiba -employing nano-technology - indicates that recharging can be done so fast that you could top off while eating lunch. Lithium -Ion battery technology is so new that I doubt that very many automotive engineers have even heard of them, much less thought to use them in this manner. Their energy density exceeds that of any other form of rechargeable energy storage. The Lithium Ion battery is the most efficient battery available right now. So is the outer rotor electric motor the most efficient motor. Build an Automobile right and it will weight less and have simpler, easier to repair/replace modules. Lets see what we can eliminate while improving performance and efficiency. Use bio-oil/fuels for both fuel and lubrication. Feel free to pass this along to anyone you know in the Transportation business. I bought a Honda Civic Hybrid last summer. I enjoy it more than any vehicle I've ever owned. I will Never buy another vehicle that isn't a Hybrid and doesn't get at least 50 mpg. As far as I can tell, Detroit isn't even thinking the same way I and the vast majority of its potential customers are. Mitsubishi has produced the wheel motor/drive I mentioned above. 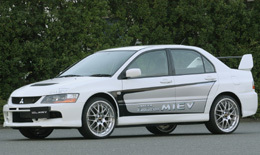 You can see an illustration at: http://www.greencarcongress.com/2005/08/new_mitsubishi__1.html Scroll down and click on illustration. You can get it to fill the page by a second click. Thanks for the ideas, Lucas. I've seen them posted elsewhere before so I know you've been talking about this kind of in-wheel motor long before Mitsubishi revealed their development of the concept. I agree that plug-in series hybrids (i.e. where the internal combustion engine runs a generator and does not directly provide traction) like the one you discuss, capable of running on biofuels as well (i.e. a flex-fuel plug-in hybrid of 'trybrid'), seems like the best approach to reducing use of oil and making our transport fleet significantly more efficient. I've gone through the numbers for a series plug-in hybrid as well as full EVs here. Green Car Congress has more on the Concept CT, which was unveiled this week, as promised, at the Detroit Auto Show. Gizmag's got an article on the MIEV Concept-CT here if you're looking for more reading on the vehicle. Along with the additional un-sprung weight and reliability problems mentioned, there's also wicked torque steer if one motor should fail. In a 4WD the system can immediately shutdown the opposing wheel and get to safety on the remaining two, but a 2WD might become almost undriveable. "Along with the additional un-sprung weight and reliability problems mentioned, there's also wicked torque steer if one motor should fail." I'm sure the concept-to-production will address any reliability issues. With a simpler system than current cars, a pure EV has potentially very good reliability and ease-of-maintenance. In-wheel motors are a very effective idea for EVs. Just to let people know an electric bike won the rally. You can get the official results here, but its a japanese pdf. If someone is willing to translate, I think a lot of people would be happy.